Bridgeview Stadium or Toyota Park for sponsorship reasons is a purpose built 20,000 capacity soccer stadium located in Bridgeview village in Cook County, Illinois. 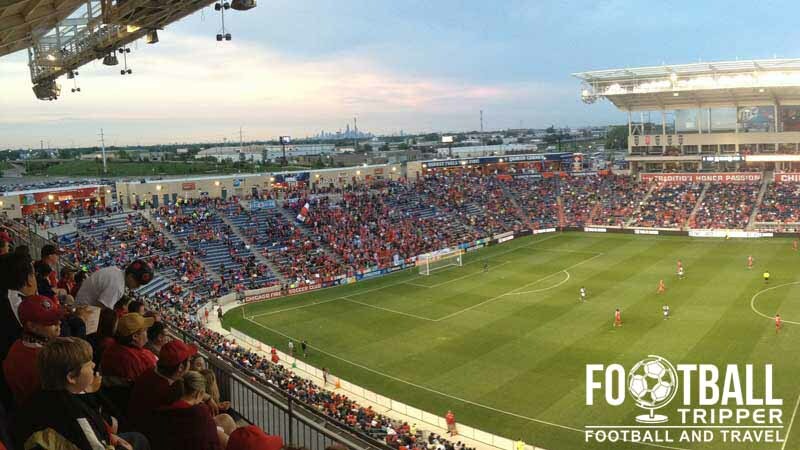 The ground opened in 2006 at a cost of around $100 million and is currently home to Major League Soccer Side Chicago Fire and the women’s soccer team Chicago Red stars. 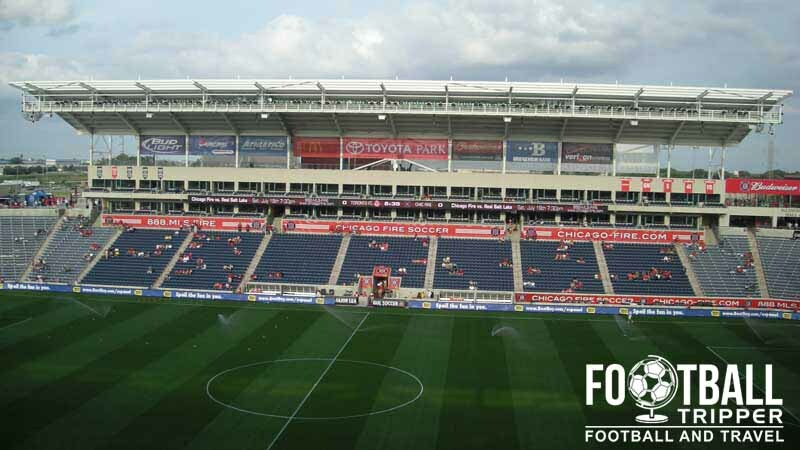 Chicago Fire first moved to Toyota Park on 11th June 2006 after previously playing their home matches at Soldier Field which is home to NFL Chicago Bears. Although Soldier Field was much larger with a capacity of 61,500 with a decent pedigree for soccer after hosting matches of the 1994 World Cup, the club opted to relocate to purpose-built facilities. 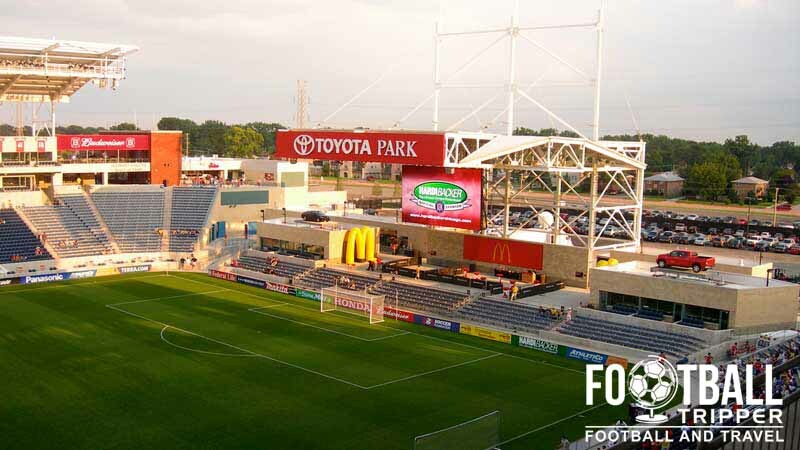 Incorporating design elements from European soccer grounds such as short distance between the pitch and the furthest away seat, and the American preference of including a concert stage behind one of the goals, Toyota Park is somewhat of a hybrid stadium. 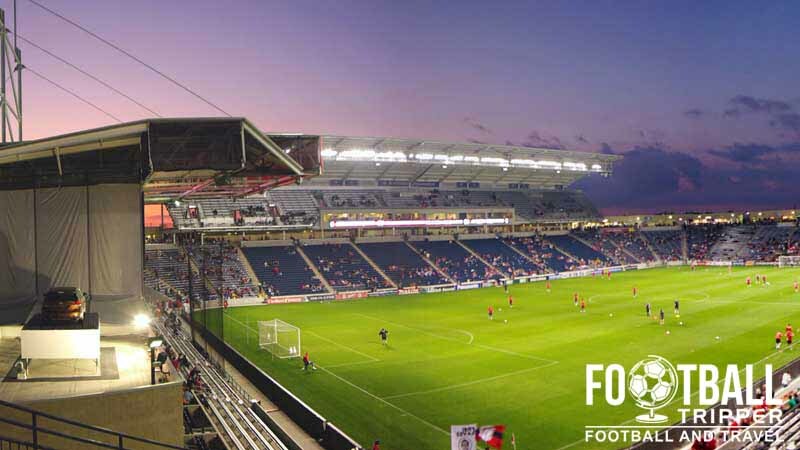 Seamlessly fusing two distinct architectural styling from two different sporting cultures, Toyota Park cost an estimated $115 million dollars by today’s prices and was designed by Rossetti Architects. The Michigan based designers have also worked on The Stub Hub Center, Rio Tinto Stadium, and PPL Park amongst other MLS Stadiums. Anticipating future growth, the stadiums is easily capable of being expanded to 30,000 with the original design planning for such an occasion. Sometimes referred to as Bridgeview Stadium, the ground is officially known as Toyota Park after the Japanese auto-mobile company signed a 10 year naming rights agreement in 2006. The highest profile soccer matches at Toyota Park to date are probably the 2010 World Cup qualification match against Trinidad and Tobago on September 10th 2008, followed by the 2006 MLS All-Star Game against Chelsea. Other pre-season friendlies against famous teams include the likes of A.C Milan and Everton F.C. Toyota Park is comprised of four stands: North, East, South and West. In association with Heineken Chicago Fire offer fans a great matchday service known as Pub to pitch. The shuttle bus allows fans to drink without worrying about drivings, and picks up fans from several pubs throughout the city. Check out the link for more information, but for non-season ticket holders it costs $15.00. It’s ideal for those who like a drink and matchday camaraderie with fellow socer fans. Inside the gate there are numerous concession stands serving each stand, with popular stadium classics such as hotdogs, popcorn and hamburgers all readily available to fans. Chicago Fire operate a permanent club shop at the stadium in addition to several merchandising kiosks on match days and an official online shop run in conjunction with the league’s official MLS Store. Inside Chicago Fire’s club shop at Toyota Park. Guaranteed to sell the hottest merchandise in the whole of MLS. 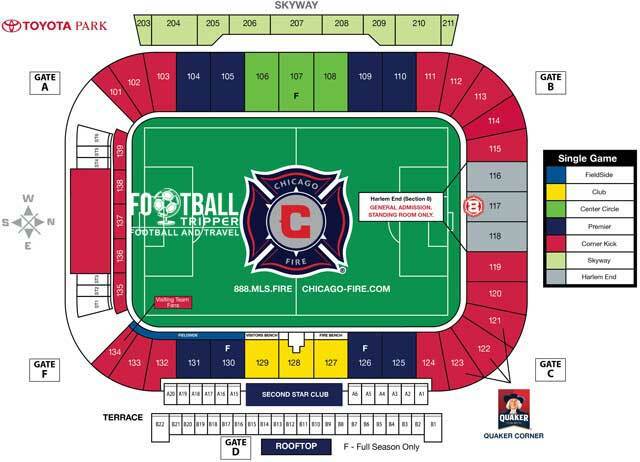 It doesn’t appear as if Chicago Fire currently offer fans the chance to tour the facilities at Toyota Park, however if this ever changes we’ll be sure to update this section. Please note all prices are illustrative examples from one match and don’t include booking fees or every section of the ground. Toyota Park is located in Bridgeview Illinois approximately 12 miles south-west from downtown Chicago. A Chicago Fire on the perimeter of Toyota Park Stadium. Driving in Chicago isn’t regarded as one of the most serene of pastimes, however for a lot of Fire Soccer fans it is the default mode of transport on matchdays – especially as the stadium isn’t ideally suited to the city’s world class public transport. Parking lots at the stadium open for up to three hours before kick-off and cost $15.00 per car, and $30.00 for RV or buses. The two largest, the north and east lot both permit general parking with this handy parking map showing you where you need to go. Tailgating is permitted in official car parks before kick-off, and Section 8 is regarded as the best for atmosphere as it is where several prominent supporters groups congregate before kick-off. Chicago Fire fans can travel to the ground on matchdays by catching the Toyota Park Express Bus which operates on the CTA Orange Line. Costing $1.75 for a single ticket, buses depart from Orange Line Midway station every 20 minutes for up to 2 hours before kick-off and then the return service begins 30 minutes after kick-off. Toyota Park as seen from the car park. For further information and timetables please visit the Pace Bus website. Chicago is served by two major airports: O’Hare (ORD) and Midway (MDW) with the former specialising in International flights and the latter usually used predominantly by domestic flight operators who offer budget airline travel. The two closest hotels to Toyota Park are probably the New Relax Inn and The Clayton Motel. East of the stadium on the corner of 65th street and S Cicero avenue there is a hotspot of hotels due to the airport including a Hilton, Marriott and Holiday Inn.